Dublin's Dean Rock comes under pressure from Mayo's Keith Higgins in the All-Ireland Senior Football final at Croke Park, Dublin on September 17 2017. Picture: Seamus Loughran. AS the second half wore on it became increasingly apparent that Kerry would need to score a goal to get back into the game. Their chance arrived after 67 minutes when Kieran Donaghy won the ball and handpassed to Killian Young who had joined the attack. Young needed to take the ball and zero in on Stephen Cluxton's goal but he took his eye of it and the chance was lost. Would Kerry have gone on to nick it if Young had found the net? We'll never know. JAMES McCarthy ran the ball out of Dublin's full-back sector in the aftermath of Killian Young's missed opportunity and Bernard Brogan raced down the left touchline to gather a pass out of defence. His brother Alan had just come on and his first touch was taking his brother's pass. He still had a lot of work to do when he received the ball but he raced forward and launched a long-range missile over the Kerry bar to settle the game. BOTH are talismanic figures in their respective sides and McMahon came out on top in this battle. Cooper (right) was playing in reverse all day and tackling back, particularly at age 32, isn't his game. Dublin manager Jim Gavin got his tactics spot on by sending McMahon out to make the Dr Croke's Allstar mark him. It was curious that Kerry manager Eamonn Fitzmaurice didn't decide either to move Cooper to full-forward or substitute him. MAYO had made a decent start to the second half and the sides were level when Rob Hennelly came to collect what should have been a simple ball, but spilled it at Paddy Andrews's feet and had to pull him down to prevent a goal. Diarmuid Connolly's brilliant penalty left Mayo playing catch-up again for the last half hour. 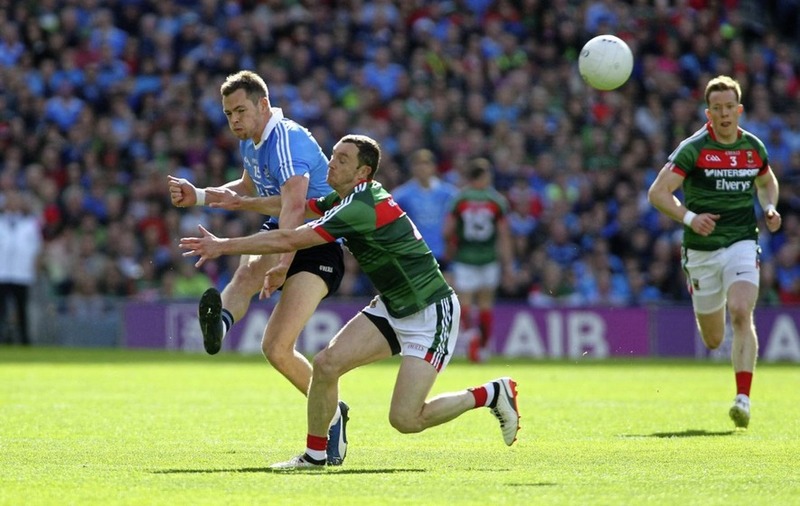 WITH Dublin just threatening to pull away heading into the last 15 minutes, Mayo were in desperate need of a score. Their attack looked to have stagnated out on the left wing when Patrick Durcan got his hands on the ball, but he steadied and fired a superb shot from 40 yards that hung for an eternity before coming down on the roof of Stephen Cluxton's net. IN many ways, Parsons epitomised Mayo's spirit. Times he looked dead on his feet, but he'd find the energy to make the run back, to get the hand in and tackle. But this too was Flynn's best performance of the year, and perhaps a window into his Dublin future as a midfielder. THERE were 48 minutes gone when John Small went through the back of Mayo's Colm Boyle and left the Davitt's clubman in a heap. Small had already been booked and must have known he was in trouble when he heard the blast of Joe McQuillan's whistle. Had Donal Vaughan retained his composure, Mayo would have had an extra man for the crucial last 20 minutes. But he lost his cool, retaliated and was shown a straight red. THE first score of the game was never topped. 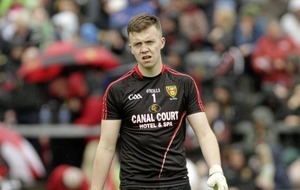 Con O'Callaghan made his presence felt with his first involvement in his first All-Ireland final. 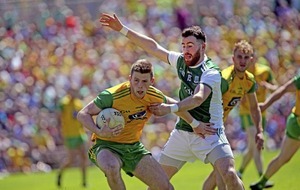 He picked the ball up deep in opposition territory before charging forward on a weaving run that left Colm Boyle in his wake. With the goal in his sights, he produced a sliderule finish that sent Hill 16 into raptures. Dublin's main man, and he did that job very well. Dublin's so-called ‘quarterback' was on the ball very little compared to his usual heavy influence and Keegan was even able to get up the field to score his side's goal. That impact made a match of this final, but Kilkenny had the last laugh, despite being black-carded after scuffling on the ground with Keegan after the match-winning free went over. Dublin: S Cluxton (capt. ); P McMahon, C O'Sullivan, M Fitzsimons; J Cooper, J Small (0-1), J McCaffrey; B Fenton (0-1), J McCarthy (0-2); C Kilkenny, C O'Callaghan (1-0), E O'Gara (0-1); P Mannion (0-3), P Andrews, D Rock (0-7, 0-3 frees). Subs: P Flynn for McCaffrey (9); D Connolly (0-1) for Andrews (h-t); K McManamon (0-1) for O'Gara (h-t); B Brogan for Flynn (65); N Scully for O'Callaghan (68); C Costello for Mannion (74). Mayo: D Clarke; B Harrison, C Barrett, K Higgins; L Keegan (1-0), C Boyle (0-1), P Durcan; S O'Shea, T Parsons; K McLoughlin (0-2), A O'Shea, D Vaughan (0-1); J Doherty (0-2), C O'Connor (capt.) (0-7, 0-4 frees), A Moran (0-3). Subs: D O'Connor for S O'Shea (51); S Coen for Boyle (55); C Loftus for Moran (63); D Drake for Doherty (70); G Cafferkey for Higgins (75); D Kirby for McLoughlin (75).